Paul Rowe's investigations into the appearance of hydrogen gas seemingly out of nothing during electrical or explosive discharge in a vacuum have stirred a good deal of interest. Previous articles on this line of research are Hydrogen From Space - The Aether 'Comes Alive' and A History of Dark Matter?. To complete the picture, here is another article by Rowe which documents the appearance not only of hydrogen but also of other elements under these same 'surprisingly mild' conditions, as reported in the scientific literature of the past century. 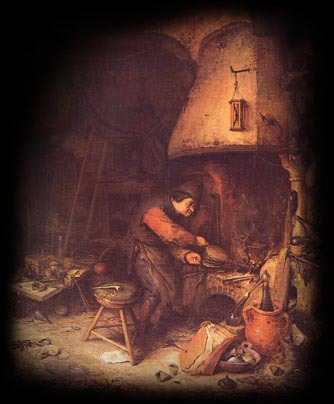 We tend to dismiss Alchemy as a subject full of superstition, not worthy of scientific consideration. In the light of these published findings of eminent scientists discussed by Paul Rowe, should we perhaps revise our views and extend our concept of physics to include things for which we have - as yet - no explanation? Here the article by Rowe, previously printed in Infinite Energy magazine. Bockris and Minevski of Texas A&M University recently reported experimental results that strongly suggest that palladium atoms near the surface of hydrogen atom-saturated catalysts are transformed into atoms of other elements under certain mild electrical conditions. Minzuno, Ohmori and Enyo reported similar results with palladium catalysts saturated with deuterium atoms. The isotope make up of the elements produced were quite different than that which occurs in nature. It is extremely difficult (perhaps impossible) to explain these experimental results, unless one accepts that transmutation has occurred. This article will attempt to demonstrate that experimental results reported prior to 1930 lead to a similar conclusion. Between 1910 and 1930, many experimenters (some extremely well respected) reported the mysterious appearance of hydrogen, helium and neon in electrical discharge tubes.1 E.C.C. Baly, a Fellow of the Royal Society, summarized pertinent results in the Annual Reports of the Chemical Society for 1924 (pages 41 to 47) and 1920 (pages 27 to 35). He published results of his own experiments with R.W. Riding in 1925 and 1926. They concluded that nitrogen atoms had been converted into helium and neon during their high voltage electrical discharge experiments. These experiments were later described in greater detail. In 1923, Baly performed many variations of Collie's experiments with R.A. Bailey3. They found neither helium nor neon. X3 was later found to be H3 (triatomic hydrogen), which has a half-life of about one minute5. If the helium and neon had diffused through the glass walls of the apparatus, the nature of the salt bombarded would have had no effect on the rare gas concentration. Perhaps, some of the atoms recently detected10,11 are parts of atoms that remain when helium is split off. Other experimenters have shown that helium and neon from the air slowly diffuse through very hot glass walls into vacuum. The reasons for this view were summarized by Robert W. Lawson of the University of Sheffield. However, this does not explain the appearance of these gases only when oxygen is present and the anticathode has a nitride coat. It also obviates any possibility that the rare gases had diffused through the walls of the apparatus. Baly and Riding's conclusion that nitrogen atoms are transformed into helium and neon atoms (and possibly other atoms) under their experimental conditions, did not conform to the, then, or present views of theoretical nuclear physics. They measured the emission spectra of gaseous products. They did not measure non-gaseous products. Bockris and Minervski's10 results, confirmed by Mizuno, Ohmori and Enyo11 suggest that, under somewhat different conditions, palladium atoms are transformed into platinum, silicon and zinc and possibly other atoms. They did not measure gaseous products. The simplest conclusion from the above observations is that transmutation of elements has taken place under surprisingly mild conditions. Theoretical nuclear scientists find that such a conclusion defies one of their time-honored concepts. I, for one, am willing to consider that their concept is incorrect. This is a re-edited version of a paper published in the May-June, 1996, #8 issue of Infinite Energy. I've had a feeling for years that if we really looked into the vacuum throughout the cosmos, we'd find all sorts of virtual/real transitions going on that are quite amazing. There's no reason to believe that it isn't possible and taking place. As T. Henry Moray pointed out, it is a sea of energy, and with the infinite instances taking place each moment, it is also a sea of infinite possibility that only pompous fools would claim real and anywhere nearly complete knowledge of. As in the quantum world, it's our own observing that limits the results, just as in the film "What the Bleep do We Know?". When you consider this, where are we on the real evolutionary ladder compared to where we could be if we spent our resources on constructively solving the riddles and real problems of our existence rather than on war, death, and destruction? At the struggling, confused bottom. The old saying is quite correct. Everything that happens is magic until we understand how it happens. The Y-Bias model explains precisely what happens to drive this phenomenon. It is a simple matter of self-organizing criticality operating in an environment where the conditions for increasingly sophisticated, complex organization are optimal. How the conditions occur is also explained in the model...highly energized locales provide the impetus for ambient constituents to interact with optimal angles of intersection, possessing sufficiently energized status to breach the minimal quantum noise thresholds. All the constituents required to create an atom of Hydrogen are everywhere in abundance in lesser energized, lesser complex forms. It is in this respect that the standard model of physics is woefully inadequate and fundamentally flawed. The Big Bang idea suggests that all the constituents needed to produce Hydrogen were all produced at one instant - the new model suggests that all the underlying stressors represented by virtual ensembles, forming at the zero point, combine with increasing complexity and annihilate to lower energy states all the time, in every address in the cosmos, constantly forming and unforming to produce the physical world we live in. Rowe's discovery is not really new and the dynamics that drive it are clearly understood. Our challenge is to get this information out into the world so that what appears to be magical can be elevated to the status of something that is both understood and useful. In respect to your note of the third of March, I have been working on transmutation since 1991. We were able to obtain gold in low quantities (a few hundred ppm) and a number of other metals inside palladium in the presence of deuterium. Now, you have certainly heard of the psychoanalyst Reich who was condemned by the American government, his books burned and he died in jail. (His assistant had carried some apparatus across the state line.) Reich was an original thinker and among the things he did was to create things from nothing. Of course, I can't give you all the etails to this. You would find them in books on Reich. I read about this part of his work recently. There was also much earlier work on this and by none other than J.J.Thompson. The idea that materials come from something is, of course, relatively new. If you read about Sai Baba, - as I am sure you do, - he is able to create things from nothing all the time. He does it every day and he goes around in front of those who come to admire him and produces Jibuti. He also produces other very complicated things including jewelry and so on under conditions in which it is difficult to conceive that they could be produced in any way but "from nothing." For example on some occasions he will toss something in the air and call out as to what it will be and it will be formed in the air. You might wish to forward this memo to Paul Rowe. thank you for your fax message, which I have re-typed and am sending on to Paul Rowe, the author of the article that relates the results of appearance of hydrogen from vacuum, both in his own experiments and in those of earlier researchers. Yes, I have heard of Reich and the untimely end he met at the hands of the American authorities, who did everything to erase every trace of his work. I also read of several researchers who obtained transmutation of elements in their electrodes in cold fusion type experiments. I am not a great fan of Sai Baba instead, at least I have not studied about him. He may or may not be able to make things appear from nothing, but that is - I believe - of little relevance to the discussion of scientific experiments that show that perhaps the vacuum is not an emptiness, as assumed by physics today. You are right, it is extremely difficult to explain these experimental results, unless one accepts that transmutation has occurred. To confirm the results one has to do it oneself. My concern about nuclear catalytic resonance energy is the name; shouldn't it be transmutation of elements? And the fact that capacitance batteries cannot hold more than the coil and an energy input immediately discharges the entire circuit. Which is why we are looking for a live organism that can do the change for us; aka sulfur bacteria. The 'discharge of the entire circuit' part is what may have caused the anistrophic tear in the stratosphere over the Cayman Trench, formerly land mass and now a 5 mile deep hole in the sea floor. Consider that we have done all this before, and if you see the geologic record S W Carey saw, one may conclude it turned out to be poorly advised.